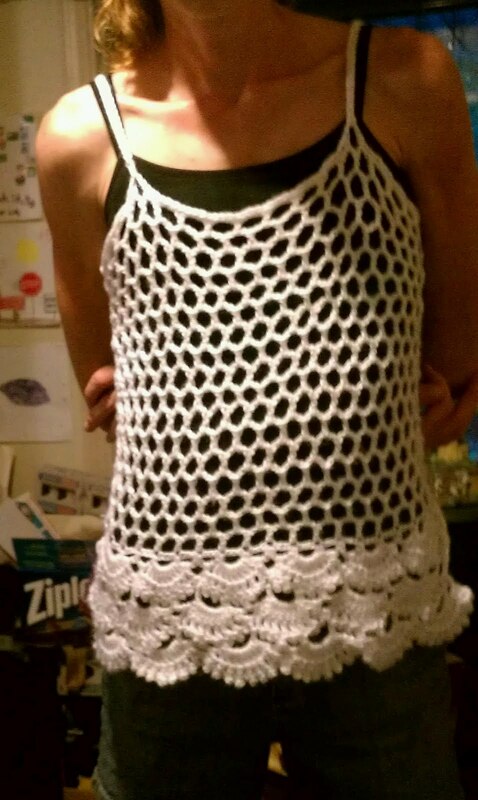 Two years ago I got the bright Idea to crochet myself a sweater. It was a stripped sweater and the colors I chose were similar to those specified in the pattern - bright yellow, peacock blue, and a lime green. At that time I was still inexperienced when it came to crocheting big things, especially things more complicated than a flat blanket. Halfway through making the sweater, I was sick of the colors. By the time I finished all pieces, I didn't even want to wear it anymore. And it also turned out smaller than I planned. Needless to say, that sweater, or the parts of that sweater, are still sitting in the bottom of my craft bin. 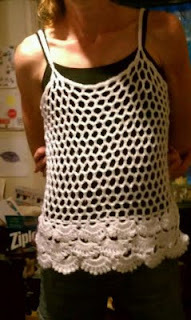 Earlier this summer I decided to take another stab at crocheting clothing. This time I chose a tank top. That had to be easier than a sweater, right? And it was. I stitched up the front, and then the back which was identical. All that was left was sewing those two pieces together and adding simple straps. I will say I had to redo the straps because they weren't long enough the first time around, but after my second attempt, I was so proud of my work. What makes me even prouder of my work is that my tank held up and passed the ultimate test - the washing machine. It actually fits better after I washed it than before. I have decided that if it doesn't have sleeves, I can make it. That is why I'm hoping my latest project turns out just as well as the tank. I just hope my fingers don't fall off before I'm done! That is so cute I love it..
Great job! Looks really cute! It's so pretty! I can barely sew a button on, so I'm impressed. I think it's pretty cool to actually wear something you made for yourself! Go you! So pretty!! That's amazing work!!!! That is beyond cute!! Totally looks like something that would come from some fancy store. Are you freaking kidding me? YOU MADE THAT? Beyond adorable!